Like regular roadmaps, Master roadmaps can be renamed, duplicated, and deleted. There are two ways you can manage a Master roadmap: from your Roadmap Home and from the roadmap itself. 1. If you're not already in your Roadmap Home, click the Home icon on the upper-left corner of the application screen. 2. In the Roadmap Home navbar, click Masters. 3. In the Masters tab, select the Master roadmap you want to rename. 4. On the Masters tool bar, click the Rename icon. TIP: If the icon is grayed-out, you don't have permission to rename the Master (see Who can rename, duplicate, or delete a Master roadmap? below). 5. In the Master Properties dialog, enter a new name (Title) for the Master. 1. On the Roadmap navbar, click to open the Master Roadmap dropdown. 2. In the dropdown, select Rename Master. TIP: If the selection is grayed-out, you don't have permission to rename the Master (see Who can rename, duplicate, or delete a Master roadmap? below). 3. 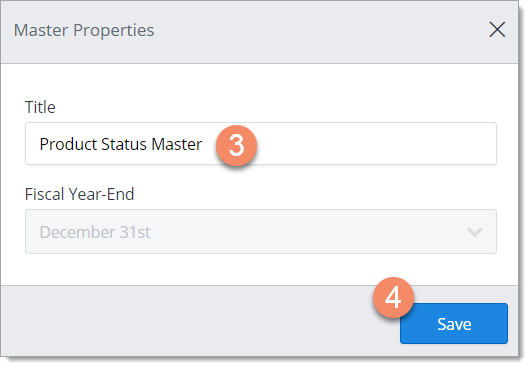 In the Master Properties dialog, enter a new name (Title) for the Master. 3. In the Masters tab, select the Master roadmap you want to duplicate. 4. On the Masters tool bar, click the Duplicate icon. TIP: If the icon is grayed-out, you don't have permission to duplicate the Master (see Who can rename, duplicate, or delete a Master roadmap? below). 5. In the Duplicate Master dialog, enter a new name (Title) for the duplicate Master. 6. If you want copy the original Master's sharing settings to the new Master, select the Share it with the same people checkbox. 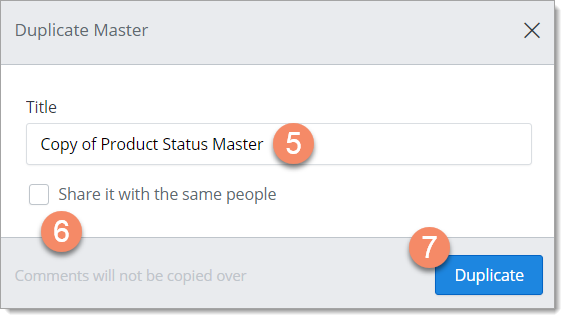 TIP: To learn more, see What happens to data and sharing settings in a duplicated Master? below. 1. On the Master Roadmap navbar, click to open the Roadmap dropdown. TIP: If the selection is grayed-out, you don't have permission to delete the Master (see Who can rename, duplicate, or delete a Master roadmap? below). 3. In the Duplicate Master dialog, enter a new name (Title) for the duplicate Master. What happens to data and sharing settings in a duplicated Master? The user who duplicates a Master becomes the Owner of the new Master. If the Share it with the same people option is selected when duplicating the Master, the new Master inherits all Viewers from the original Master. If the option is NOT selected, the only user with access to the new Master is the Owner, as explained in item 1 above. 3. In the Masters tab, select the Master roadmap you want to delete. 4. On the Masters tool bar, click the Delete icon. TIP: If the icon is grayed-out, you don't have permission to delete the Master (see Who can rename, duplicate, or delete a Master roadmap? below). 5. In the Delete Master dialog, click Delete it. To cancel the deletion, click Cancel. 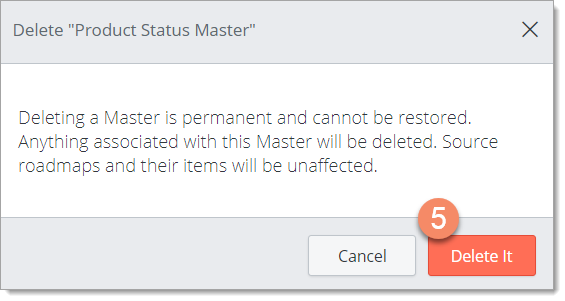 WARNING: Deleting a Master is permanent and cannot be restored. Anything associated with this Master will be deleted. Source roadmaps and their items will be unaffected. 2. In the dropdown, select Delete Master. 3. In the Delete Master dialog, click Delete it. To cancel the deletion, click Cancel. Who can rename, duplicate, or delete a Master roadmap? Only the Owner of a Master roadmap can rename or delete it. If a Master roadmap has been shared with you, you have View-only access and can only duplicate it. To find out more about Master roadmap sharing and permissions, go to Sharing and collaboration in the Quick Guide and Share your Master roadmap in this collection.